Today: Test Kitchen Manager Erin McDowell depends on warm stuff on bread to get her through her days. One of the greatest challenges I’ve faced in the past few years is learning to work effectively from home. Sixty percent of my job is spent behind a stove (and lucky for me, a good chunk of that is at my own—I love having home-court advantage). The other forty percent is split between the aisles of the grocery store and my desk. But despite always being around food, one of the ways I’ve mastered my own effectiveness is by eating lunch. Taking 30 or 40 minutes to make and eat a quick bite breaks up my day and keeps me on task all morning, then fuels me for the afternoon. Sorry, breakfast: Lunch has pretty much become the most important meal of my day. And I owe it all to the fabulous tartine, a warm, crisp, open-faced sandwich piled high with anything you have on hand (and with a fabulous name to boot). In my world, you could call most of my lunches “leftovers on toast with a side salad,” but I much prefer to call them tartines. While I have the advantage of being able to warm my leftovers on the stovetop or in the oven, rather than being confined to a break-room microwave, I think the same concepts can apply to any working lunch—or, as I have discovered, to happy hour snacks. Or as an appetizer before a large meal. Or for Sunday brunch. Or with your tea in the afternoon. Or, with extra cheese on top, for an excellent midnight munchie. Yep, told you I’m obsessed. More: How to fix good lunches in an office kitchen. Clockwise from top left: Braised beef and cheese; Parmesan and fried egg; brie and blackberries; smashed tomatoes and fix-ins. Braised beef and cheese: Shred leftover braised meat onto a piece of toast and top it with melty cheese (fave combo: braised beef with sharp cheddar). Run it under the broiler until the cheese melts, then top it with salsa verde, a drizzle of sour cream, and some pickled red onions. Smashed tomatoes and fix-ins: Smash roasted tomatoes onto a piece of warm toast (no need to warm the tomatoes). Top with crumbled feta, capers, and a drizzle of balsamic vinegar. Parmesan and fried egg: Grate parmesan all over a piece of bread and run it under the broiler until crisp. Top with lightly dressed arugula and a fried egg, plus lots of salt and pepper. 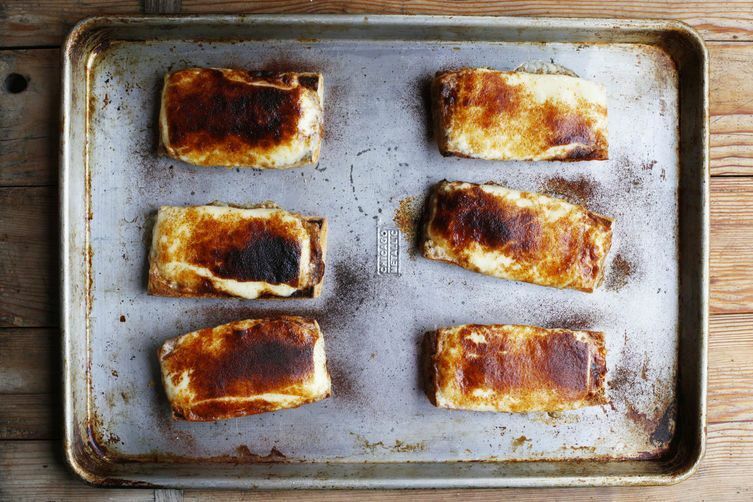 Try frying your bread a la Kristen for a base you won’t soon forget. 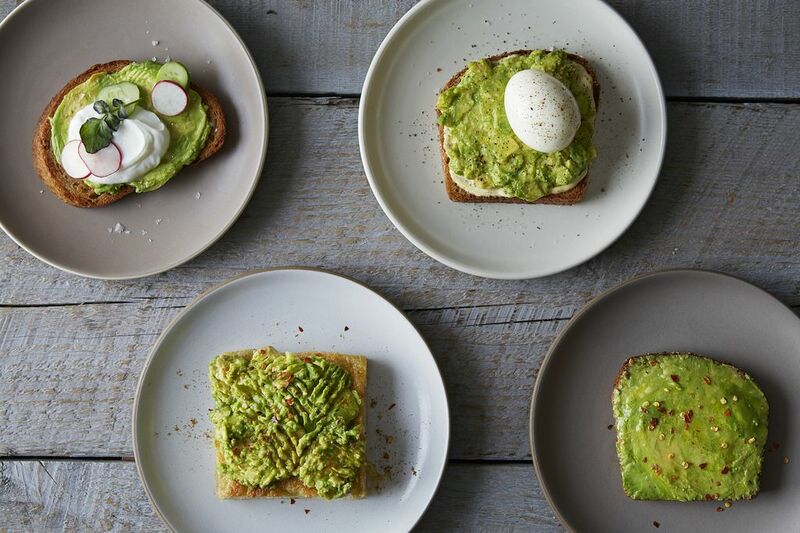 We all love avocado toast, no question—try a few remixes. It’s almost summer! 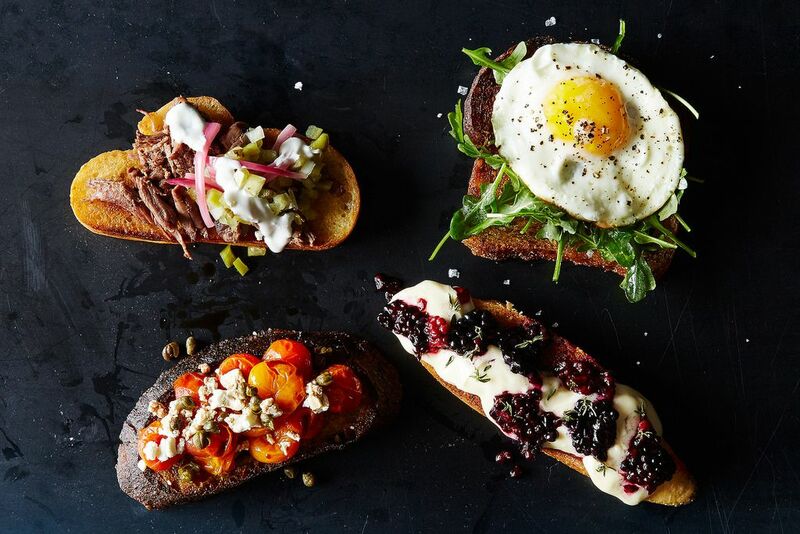 Fire up the grill and, trust me, your toasts will be pumped. When all else fails, you can’t go wrong with cheese, cheese, cheese.